Meet my new best friend for the semester: capstone. - I bet you think this blog is about you. Meet my new best friend for the semester: capstone. Yes, I can be friends with a house. Don't judge. Yesterday I took a day trip to Flint with my fellow classmates and instructors for our master's capstone project. 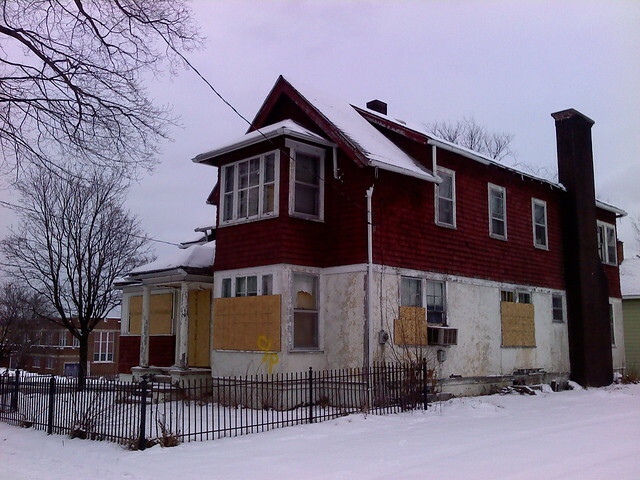 In brief, we will be working with the University of Michigan-Flint's resource science department and the Genesee County Land Bank to develop an abandoned house into a combo classroom-living* space in an existing neighborhood near campus. It is intended to also be a showcase of energy efficiency, possibly including a geothermal field in the adjacent open lot. While we won't be in charge of the renovation, we've been tasked with ensuring the stakeholders know all of the planning and zoning bits they need to be in line with, and how it can best fit with the neighborhood context. I'm jazzed about the project, and especially about spending time in Flint. We met with the neighborhood association, primarily long-time residents (some are also landlords in the area) that are savvy about getting positive intervention in their area and resisting the negative, and they certainly know the difference. More updates to come. * With three small apartments on the second floor. International students in particular appear to be potential tenants. I don't think the words "I'm jazzed about spending time in Flint" have ever appeared together in print before. But more people should, because 1) it's cheap, 2) there are never traffic jams, and 3) they still make an assload of GM trucks every year.